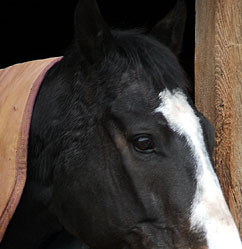 There are 12 horses-ponies at the riding centre to suit all abilities and size of riders. Most of the horses have been at Grafton Farm for many years. Pupils can book group or private lessons which are given on flatwork or jumping. For prices view our horse riding lesson rates. Escorted hacking is available from the riding centre. Grafton Farm is set in beautiful countryside and there are many one or two hour hacks for pupils to enjoy direct from the farm. Pupils must be at least 8 years old and experienced riders to go out hacking. For hacking prices see our hacking rates. For hacking ring and book or leave a message on the landline on 01568 750602. In the evenings Monday - Friday 7pm - 9pm. Regular competitions e.g. dressage, showjumping and handy pony are run at the riding centre for pupils. At the end of the year, points from the competitions are added up and champion rosettes and cups are presented to the overall winners. For details see programme see programme. During the school holidays all day activities are organised at the riding centre. These include pony for the day, fun days, test training days and test days. Pony care and stable management are also taught and all courses are very popular. The lecture room is a tremendous benefit for these days. For details see programme see programme. The riding school is also a pony club centre which mens that pupis can join the pony club and use the riding centre horses and ponies to participate in activities and pony club tests and ain achievement badges. Pupils can also train and take their B.H.S Road Safety Test. External Examiners are employed to come and take the D, D+, C and C+ tests. For details see programme see programme. The centre is an accessibilty marked RDA centre. Private sessions for disabled / special needs riders can be booked. The riding centre, horses and ponies are used each Friday during school term time by Kyre R.D.A. ;a charity which promotes riding for the disabled. The riding centre also organise and run pony parties. Each pupil is allocated a pony and participates in organised mounted games. Each child can go home with a rosette in place of a party bag. Pony parties need to be booked in advance. Grafton Farm riding centre is also a livery yard. For details availability and prices please ring 01568 750602 and leave a message. 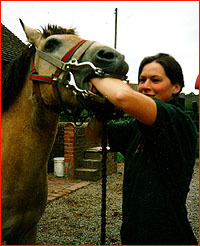 Based at Grafton Farm, Claire Thomas is a fully qualified equine dental technician. Claire also travels to clients to treat horses. See right.